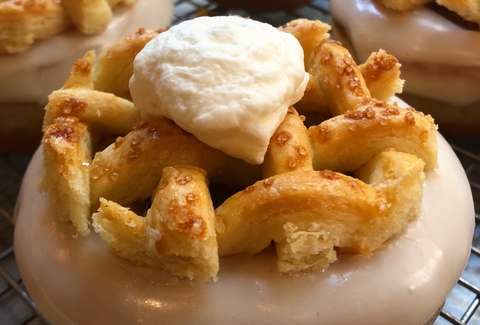 The mad donut scientists behind grilled cheese donuts, prosecco donuts, and a whole series of cocktail donuts have concocted another supremely alluring breakfast dessert for October. Unfortunately, they won't mail one directly to your mouth. The donuts are only available at the Doughnut Project's two locations in New York City through October 30, and they'll run you $4.75 each. It's a sad substitute, but if you can't partake in this Instagram-worthy limited-run sweet, Krispy Kreme has an October special, too and far more locations. For Halloween, the chain has four holiday-themed donuts available all month, including one drizzled with salted caramel and topped with crushed Halloween candy.